CleanMyMac 2, Macpaw’s catch-all utility offers scanning and cleanup of accumulated fluff—generally unused files and applications—on your Mac. What kind of fluff is removed? Generally stuff you don’t think about that hangs around in the background. Similar to Disk Doctor ( ), CleanMyMac 2 hones in on items such as unused language support files, developer-oriented files, and service copies of your iPhoto images that add to the bulk of your iPhoto library. 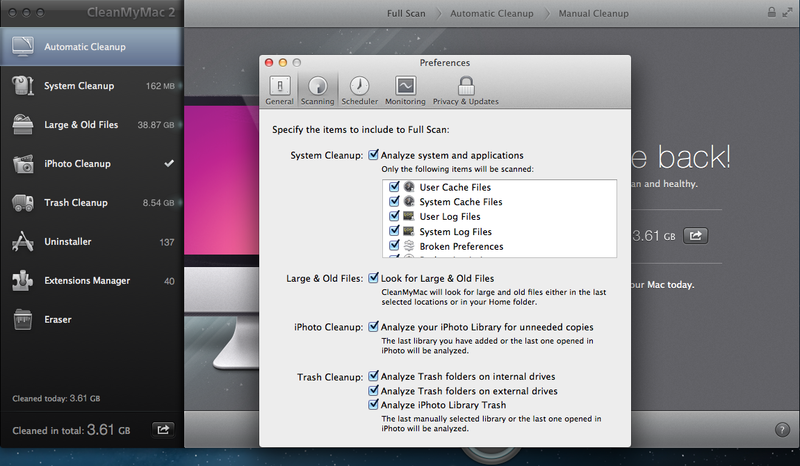 CleanMyMac 2 has seven different types of scans (Automatic Cleanup, System Cleanup, Large & Old Files, iPhoto Cleanup, Trash Cleanup, Extensions Manager, and Eraser), and each scan type is customizable, allowing you to configure what files are cleaned and removed. CleanMyMac 2's Automatic Cleanup cycle explained. CleanMyMac 2 generally removes stuff that won’t be missed, and if you’re feeling cautious—for example, you want to do a large-scale scan but leave OS X’s language files alone to ensure that upcoming software installations are smooth—just click CleanMyMac, choose Preferences, and specific elements of the scan can be configured from there. 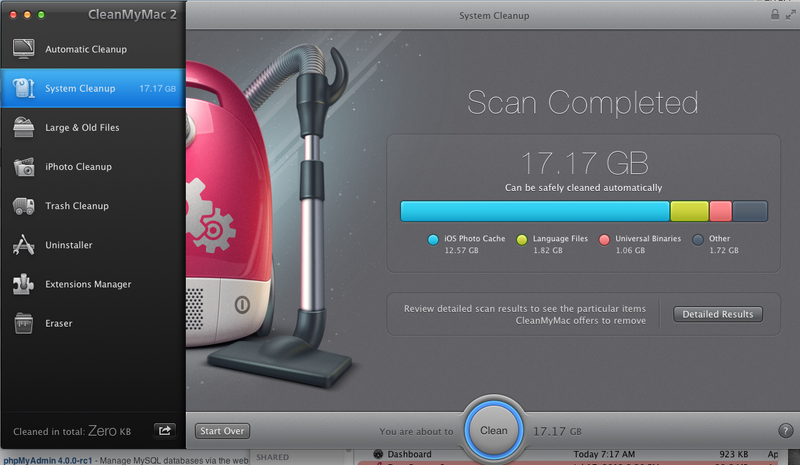 CleanMyMac 2’s interface is a series of giant buttons and tutorial animations that greet you like a happy puppy. This proves both inviting and off-putting, as the interface consumes an enormous amount of screen real estate, but CleanMyMac 2 does pack some cool bells and whistles that become worth a second look. An uninstaller application comes in handy for removing applications with assorted support files scattered throughout the operating system, and a scheduler lets you assign designated times for the program to remind you to run tests. Choose which files you'd like to scan and work with in the Preferences menu. After running CleanMyMac 2 on both a 2006 Mac Pro with OS X 10.7.5 and a 2011 MacBook Pro with OS X 10.8.3, the app shaved off 17.17GB and 6.64GB, respectively, of extraneous files, along with 2GB of extraneous files from my oversized 40GB iPhoto library. Both systems ran as smoothly as they did before the scans. Which isn’t to say there isn’t room for improvement. Finding the Preferences menu takes some exploration and discovery. CleanMyMac 2 lacks the ability to run all of its tests on external volumes—you can empty the trash files on external drives as well as clean up extra iPhoto files and remove large and old files provided you locate the iPhoto library you wish to work with or drag the hard drive icon into the program. Larger-scale tests such as Automatic Cleanup and System Cleanup aren’t available for use on external or network volumes at this point in time. 17.17GB that can be readily recovered. Not too shabby. If there's an advantage to be had with CleanMyMac 2, it's this: Macs with flash-based storage are in demand these days—the sheer speed and responsiveness outweigh the smaller storage capacities. If you’re transferring data from an old hard rive-equipped Mac to a Mac with flash storage, your old Mac may need to go on a diet and some hard decisions will have to be made as to what's transferred and what's trashed. CleanMyMac 2 doesn't solve this problem outright, but its ability to free up a few extra gigabytes of storage space makes the process a bit easier. CleanMyMac 2 isn’t perfect, but it achieves what it sets out to do—remove the detritus from your Mac and free up some drive space in the process. It offers a good amount of configuration as to what types of files are addressed and removed in the process. If the developers can wrangle the user interface into a more manageable space, and allow for full tests on external volumes, they’ll have a clear lead on other Mac utility all-in-one/spring cleaning suites seeking the same customers. 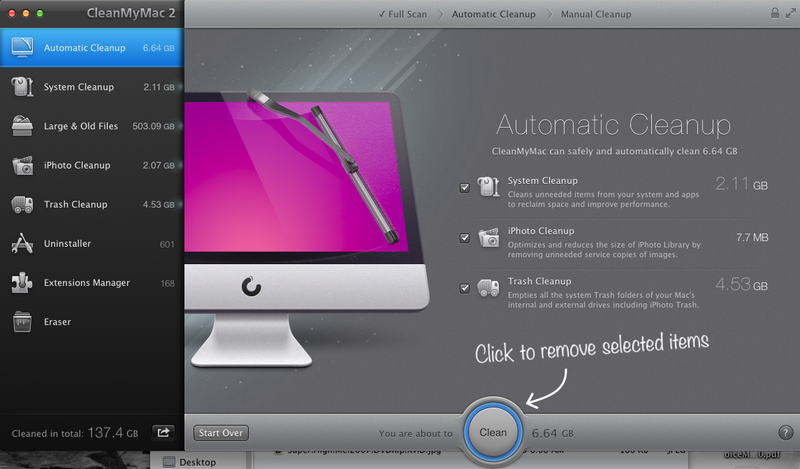 Editor's note: Updated 4/26/12 at 11 a.m. PT to correct CleanMyMac 2's ability to work on external drives. CleanMyMac 2 isn’t perfect, but it achieves what it sets out to do—remove the detritus from your Mac and free up some drive space in the process. It offers a good amount of configuration as to what types of files are addressed and removed in the process.